We have an ever changing supply of reclaimed and slab lumber. As of April 2019 we have approximately 8X8 hand hewn hardwood and softwood beams, 2x6 x 8 and 3x8 x 8-10 foot reclaimed softwood planks. 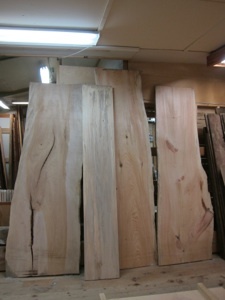 Slabs include 8/4 cherry, Burled Austrian poplar, Italian Olive. Spalted Maple and Walnut coming soon. Join us on Instagram for visual updates ! There are 140+ more pages to our website. Click home or any other link at the top or bottom of this page to learn more about Pittsford Lumber.